DAIMONOLOGIA: Was Easter Borrowed From a Pagan Holiday? Anyone encountering anti-Christian polemics will quickly come up against the accusation that a major festival practiced by Christians across the globe — namely, Easter — was actually borrowed or rather usurped from a pagan celebration. I often encounter this idea among Muslims who claim that later Christians compromised with paganism to dilute the original faith of Jesus. 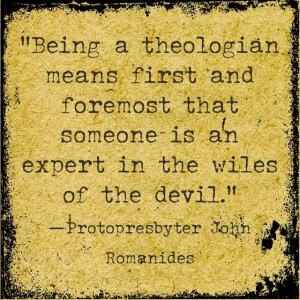 Of course, even if Christians did engage in contextualization — expressing their message and worship in the language or forms of the local people — that in no way implies doctrinal compromise. Christians around the world have sought to redeem the local culture for Christ while purging it of practices antithetical to biblical norms. After all, Christians speak of "Good Friday," but they are in no way honoring the worship of the Norse/Germanic queen of the gods Freya by doing so. But, in fact, in the case of Easter the evidence suggests otherwise: that neither the commemoration of Christ's death and resurrection nor its name are derived from paganism. "In olden times the English people — for it did not seem fitting that I should speak of other nations' observance of the year and yet be silent about my own nation's — calculated their months according to the course of the Moon. Hence, after the manner of the Greeks and the Romans, [the months] take their name from the Moon, for the Moon is called mona and the month monath. The first month, which the Latins call January, is Giuli; February is called Solmonath; March Hrethmonath; April, Eosturmonath … Eosturmonath has a name which is now translated "Paschal month" and which was once called after a goddess of theirs named Eostre, in whose honour feasts were celebrated in that month. Now they designate that Paschal season by her name, calling the joys of the new rite by the time-honoured name of the old observance." The first question, therefore, is whether the actual Christian celebration of Easter is derived from a pagan festival. This is easily answered. The Nordic/Germanic peoples (including the Anglo-Saxons) were comparative latecomers to Christianity. Pope Gregory I sent a missionary enterprise led by Augustine of Canterbury to the Anglo-Saxons in 596/7. The forcible conversion of the Saxons in Europe began under Charlemagne in 772. Hence, if "Easter" (i.e. the Christian Passover festival) was celebrated prior to those dates, any supposed pagan Anglo-Saxon festival of "Eostre" can have no significance. And there is, in fact, clear evidence that Christians celebrated an Easter/Passover festival by the second century, if not earlier. It follows that the Christian Easter/Passover celebration, which originated in the Mediterranean basin, was not influenced by any Germanic pagan festival. 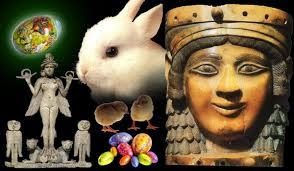 The second question is whether the name of the holiday "Easter" comes from the blurring of the Christian celebration with the worship of a purported pagan fertility goddess named "Eostre" in English and Germanic cultures. There are several problems with the passage in Bede. In his book, The Stations of the Sun, Professor Ronald Hutton (a well-known historian of British paganism and occultism) critiques Bede's sketchy knowledge of other pagan festivals, and argues that the same is true for the statement about Eostre: "It falls into a category of interpretations which Bede admitted to be his own, rather than generally agreed or proven fact." This leads us to the next problem: there is no evidence outside of Bede for the existence of this Anglo-Saxon goddess. There is no equivalent goddess in the Norse Eddas or in ancient Germanic paganism from continental Europe. Hutton suggests, therefore, that "the Anglo-Saxon Estor-monath simply meant 'the month of opening' or 'the month of beginnings,'" and concludes that there is no evidence for a pre-Christian festival in the British Isles in March or April. There is another objection to the claim that Eosturmonath has anything to do with a pagan goddess. Whereas Anglo-Saxon days were usually named after gods, such as Wednesday ("Woden's day"), the names of their months were either calendrical, such as Giuli, meaning "wheel," referring to the turn of the year; metereological-environmental, such as Solmónath (roughly February), meaning "Mud-Month"; or referred to actions taken in that period, such as Blótmónath (roughly November), meaning "Blood Month," when animals were slaughtered. No other month was dedicated to a deity, with the exception (according to Bede) of Hrethmonath (roughly March), which he claims was named after the goddess Hrethe. But like Eostre, there is no other evidence for Hrethe, nor any equivalent in Germanic/Norse mythology. Another problem with Bede's explanation concerns the Saxons in continental Europe. Einhard (c. 775-840), the courtier and biographer of Charlemagne, tells us that among Charlemagne's reforms was the renaming of the months. April was renamed Ostarmanoth. Charlemagne spoke a Germanic dialect, as did the Anglo-Saxons in Britain, although their vernacular was distinct. But why would Charlemagne change the old Roman title for the spring month to Ostarmanoth? Charlemagne was the scourge of Germanic paganism. He attacked the pagan Saxons and felled their great pillar Irminsul (after their god Irmin) in 772. He forcibly converted them to Christianity and savagely repressed them when they revolted because of this. It seems very unlikely, therefore, that Charlemagne would name a month after a Germanic goddess. So why, then, do English-speaking Christians call their holiday "Easter"? One theory for the origin of the name is that the Latin phrase in albis ("in white"), which Christians used in reference to Easter week, found its way into Old High German as eostarum, or "dawn." There is some evidence of early Germanic borrowing of Latin despite that fact that the Germanic peoples lived outside the Roman Empire—though the Angles, Saxons, and Jutes were far very removed from it. This theory presumes that the word only became current after the introduction of either Roman influence or the Christian faith, which is uncertain. But if accurate, it would demonstrate that the festival is not named after a pagan goddess. Alternatively, as Hutton suggests, Eosturmonath simply meant "the month of opening," which is comparable to the meaning of "April" in Latin. The names of both the Saxon and Latin months (which are calendrically similar) were related to spring, the season when the buds open. So Christians in ancient Anglo-Saxon and Germanic areas called their Passover holiday what they did — doubtless colloquially at first — simply because it occurred around the time of Eosturmonath/Ostarmanoth. A contemporary analogy can be found in the way Americans sometimes refer to the December period as "the holidays" in connection with Christmas and Hanukkah, or the way people sometimes speak about something happening "around Christmas," usually referring to the time at the turn of the year. The Christian title "Easter," then, essentially reflects its general date in the calendar, rather than the Paschal festival having been re-named in honor of a supposed pagan deity. Of course, the Christian commemoration of the Paschal festival rests not on the title of the celebration but on its content — namely, the remembrance of Christ's death and resurrection. It is Christ's conquest of sin, death, and Satan that gives us the right to wish everyone "Happy Easter!" Do Orthodox Icons Depict UFO's? "Pascha" or "Easter" or Both?